Mutoh America launched the new ValueJet 626UF Flatbed Printer in April 2017 to provide an expanded widtha nd depth of print to their UV-LED printing line. This newly launched printer comes with an (optional) rotary attachment that allows printing on cylindrical shapes. 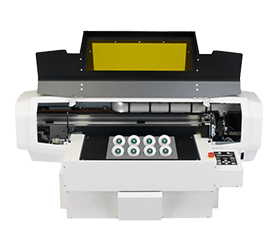 This printer can take on anything "from promotional items, directional signage, wards, specialty, labels, and packaging prototypes" that will provide an increased production capacity and improved product offering for print shops. Printing in CMYK or CMYK+white, varnish ink and the ability to print on non-white colors, this versatile unit comes at a competitive price for the performance and versatility it packs. It also includes a vacuum table and stand for easy handling. Media Size: Max material size 19" x 23.3" x 5.9"
Print Size: Max print size 18.6" x 23" x 5.9"
PDS is an authorized Mutoh reseller in Toronto offering the ValueJet 626UF for sale to the Canadian market. Please contact us for more information on pricing, availability, training and maintenance.